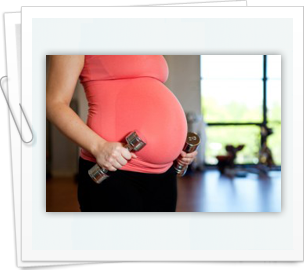 A recent study from the Johns Hopkins University School of Medicine has found that exercise during pregnancy is good for both the mother and the baby. In years past women have worried that exercise puts their baby at risk, but this study found that regular exercise actually has a positive effect on the fetus. The researchers monitored fetal heart rate and blood flow through the umbilical cord in pregnant women who performed about 30 minutes of vigorous exercise per day, pregnant women who exercised regularly but not vigorously, and pregnant women who did not exercise. The results showed that the babies of women who exercised vigorously had the lowest resting heart rates, a strong indicator of heart health. Researchers noted that the study looked only at women who had pregnancies free from complications.